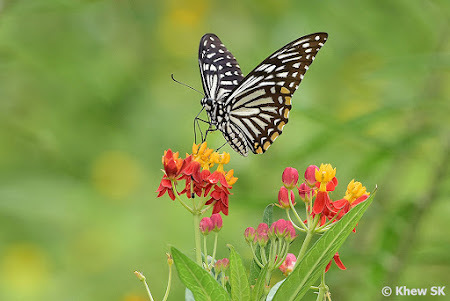 Not all flowers, no matter how brightly coloured or attractive to us human beings, attract butterflies to feed on them. Following from the Butterflies' Favourite Nectaring Plants series, of which a total of 16 different plants have been featured earlier on this blog, we now take a look at other flowering plants that butterflies sometimes stop to feed on the nectar. 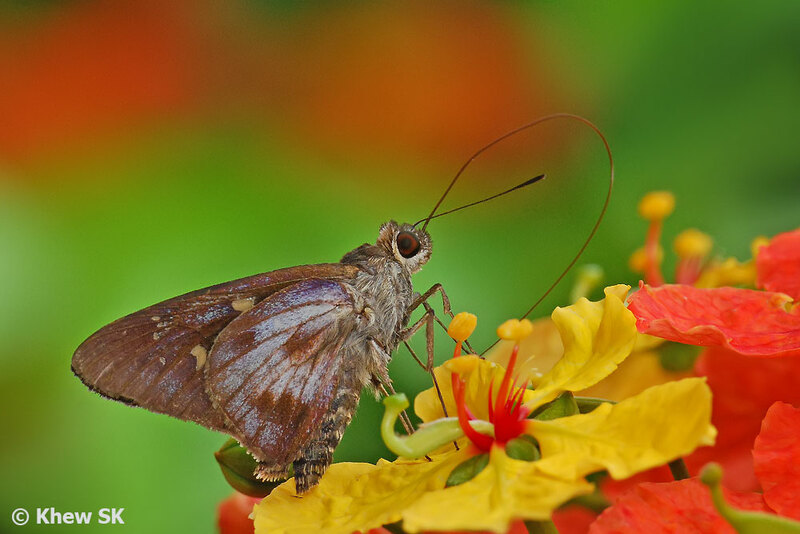 Whilst they may not be the preferred source of nectar for many butterflies, if food is in short supply, these flowering plants may provide an alternative source of sustenance for butterflies. 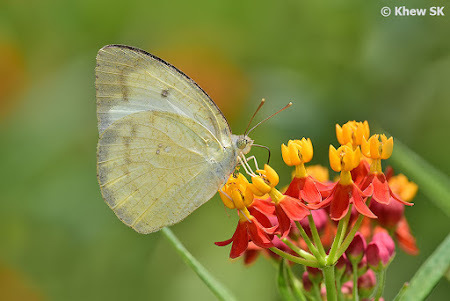 This blogpost features the first 6 of such plants, where we have observed butterflies to be feeding on their flowers. Despite the physical attractiveness (in terms of colours, visibility, etc. 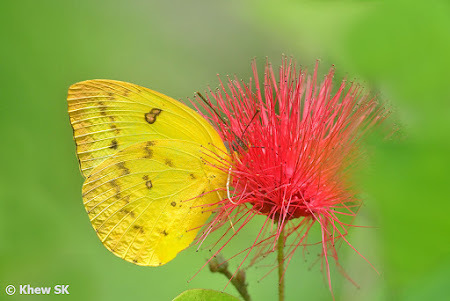 ), these flowers may not frequently have butterfly visitors, particularly when other preferred nectaring sources are available in the vicinity. 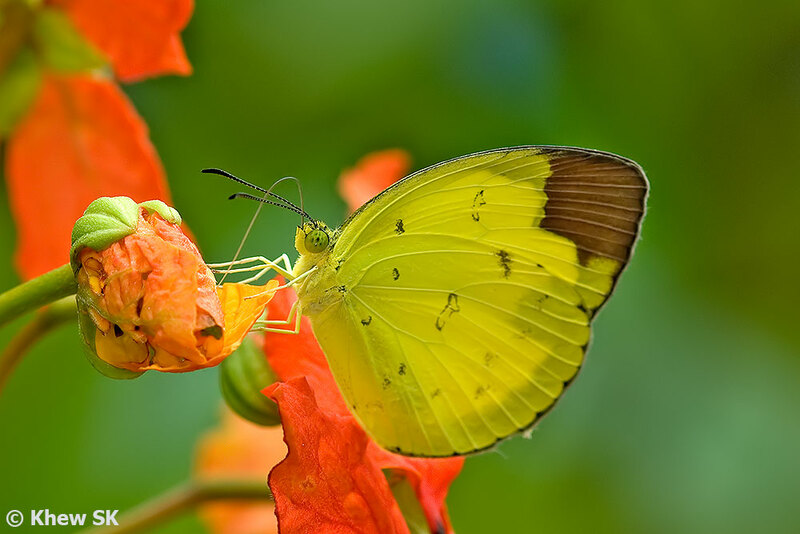 However, it is obvious from the photos in this article, that the butterflies do indeed feed on these flowering plants from time to time. This is a woody vine with simple alternate dark to pale green leaves. Flowers bloom in large clusters that open yellow but gradually turn to scarlet-orange. 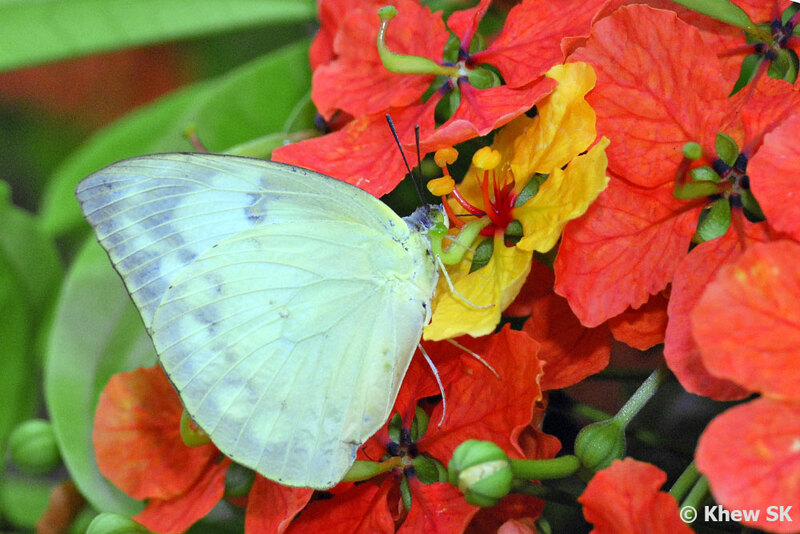 As the flowers develop in sequence, there is a mixture of different coloured flowers at any one time. 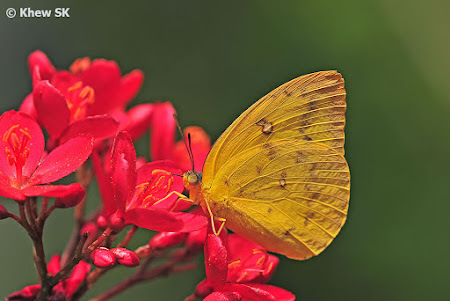 Although not as attractive to butterflies as compared to flowering plants like Lantana or the Javanese Ixora, this vine can sometimes attract several species of butterflies when food is scarce, and the range of butterflies seen include some of the bigger Papilionidae to the smaller Hesperiidae. 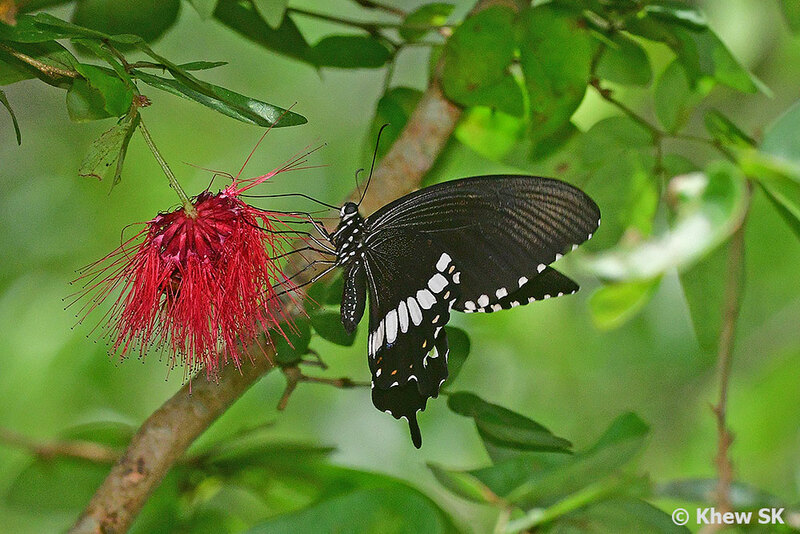 The Pagoda Flower is an erect woody shrub that grows vertically up to 1.5m to 2m tall. 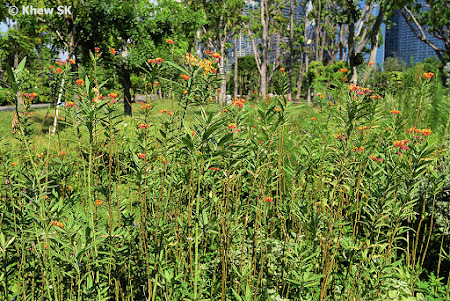 It is usually a species that is planted as part of a landscaping scheme, due to its lush green leaves and showy red flowers. It is best planted in a group so that there is ample support as it grows taller. The red flowers are attractive to several species of butterflies, but not as universally accepted as other more popular nectaring plants. 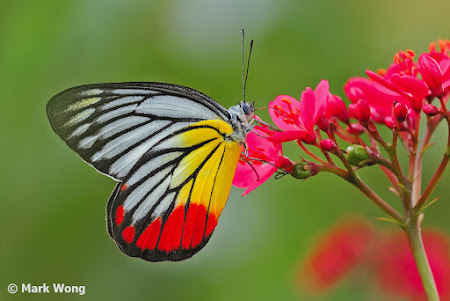 Both large butterflies (like the Common Birdwing) and smaller species (like the Painted Jezebel) and some Hesperiidae have been observed to feed on this nectaring plant. An interesting name for a plant that originates from the use of the leaves and flower heads to numb toothaches. 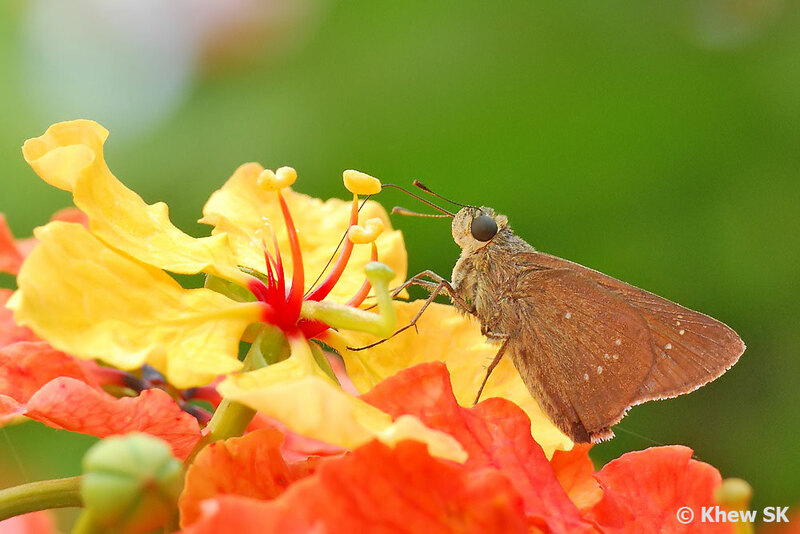 The leaves and flower heads contain an analgesic agent that, when applied to the gums and a throbbing infected tooth, will act as a pain reliever for a short while. 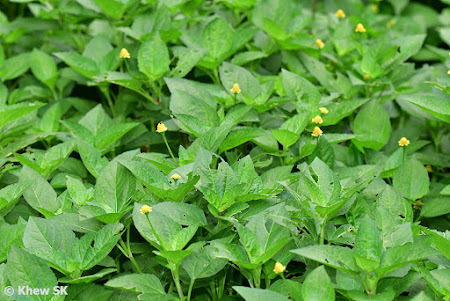 The plant is used mainly as decorative ground cover where the yellow flowers dot the landscape with some colour. Given the small florets of the flower, only smaller species of butterflies are occasionally attracted to feed on the nectar. In this case, a Cycad Blue, with its thin proboscis is observed feeding at the flower of the Toothache Plant. 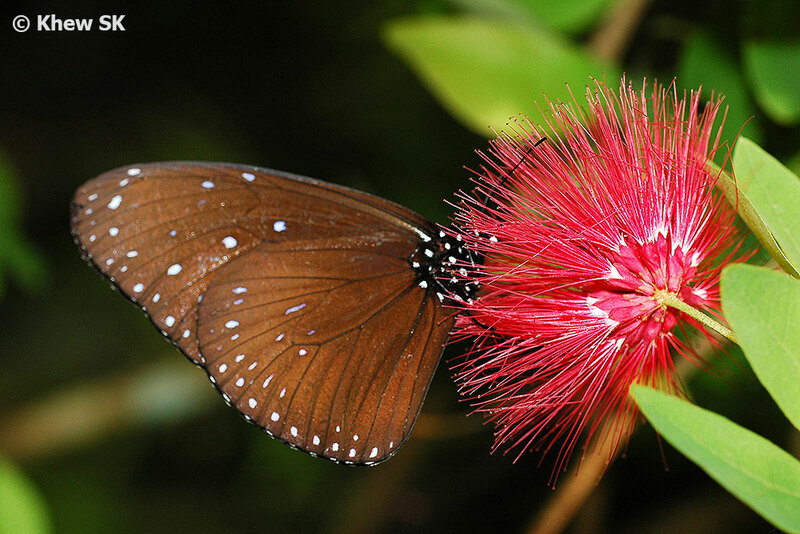 Better known as the caterpillar host plant of the Plain Tiger, the Blood Flower is a small narrow-leafed plant that grows up to 600mm tall on average. 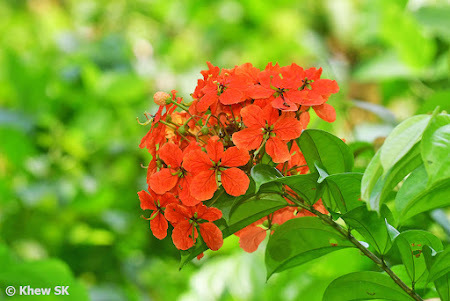 It is usually cultivated as a garden border plant and for its attractive vibrant red, orange and yellow flowers. The plant is lactiferous and the white sap is mildly toxic. The flowers are sometimes visited by some Danainae species like the Plain Tiger and Glassy Tigers, perhaps for more than just nectar, as the alkaloids that these Danainae needs may also be found in the flowers. Other species observed feeding on the Blood Flower include the Common Mime, Striped Albatross and Lemon Emigrant. 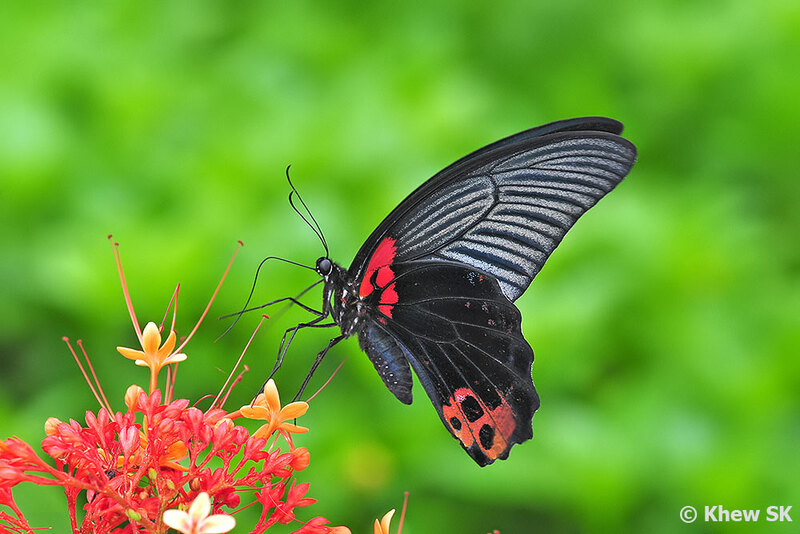 The Shanghai Beauty is a medium sized shrub that can grow to an average height of 2-3m tall. 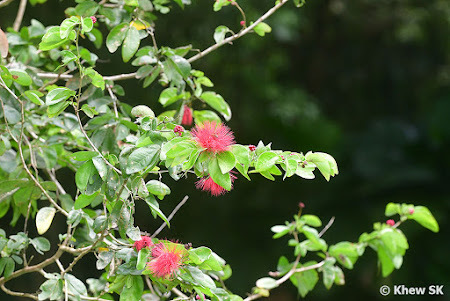 A woody evergreen species, the pink to crimson flowers are an attractive addition to any landscaping palette of plants. The stems and leaves exude a milky white sap when cut, and this sap may cause skin irritation. 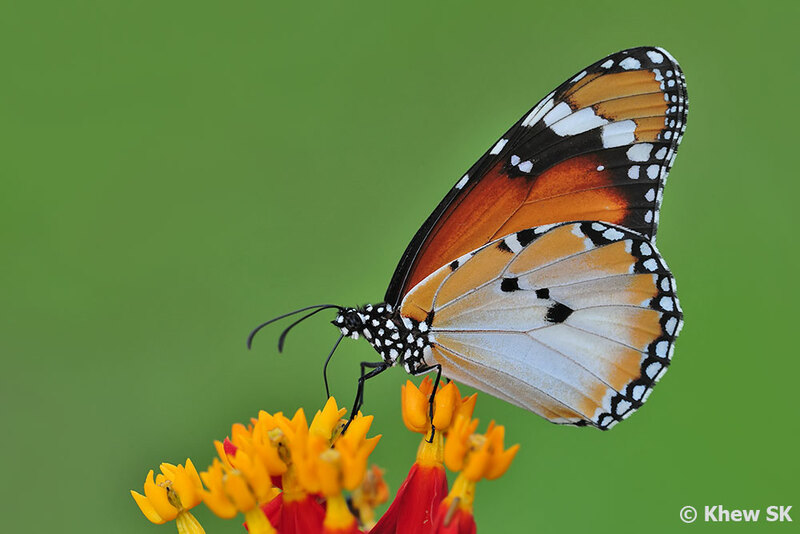 All parts of plant are poisonous when ingested due to curcin, a phytotoxin. 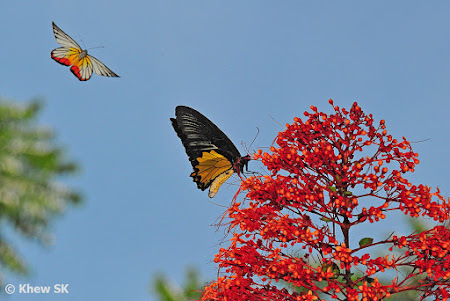 Examples of the occasional medium-sized butterflies that visit the flowers of the Jatropha to feed on nectar are the Orange Emigrant and Painted Jezebel. 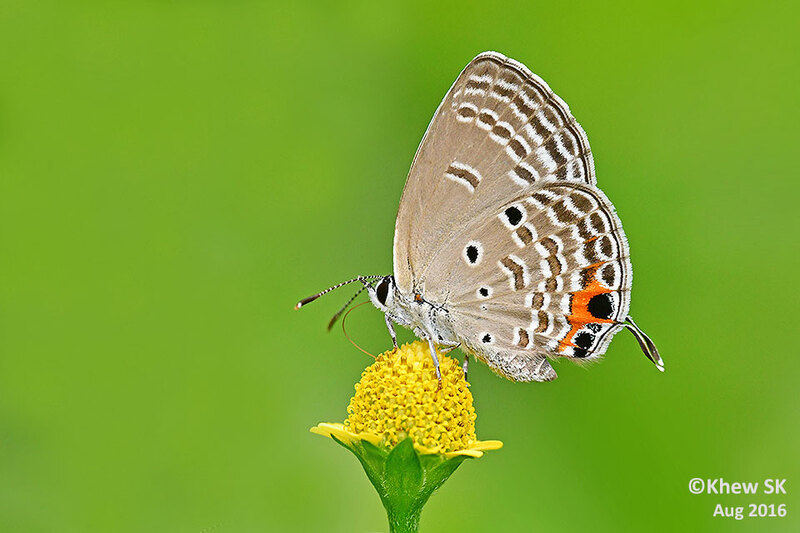 Thus far, we have not recorded the smaller Lycaenidae or Hesperiidae butterflies feeding on this flower. The Red Powderpuff shrub is so named because of its unique bushy flowers that resemble a powder puff found in women's makeup kits. 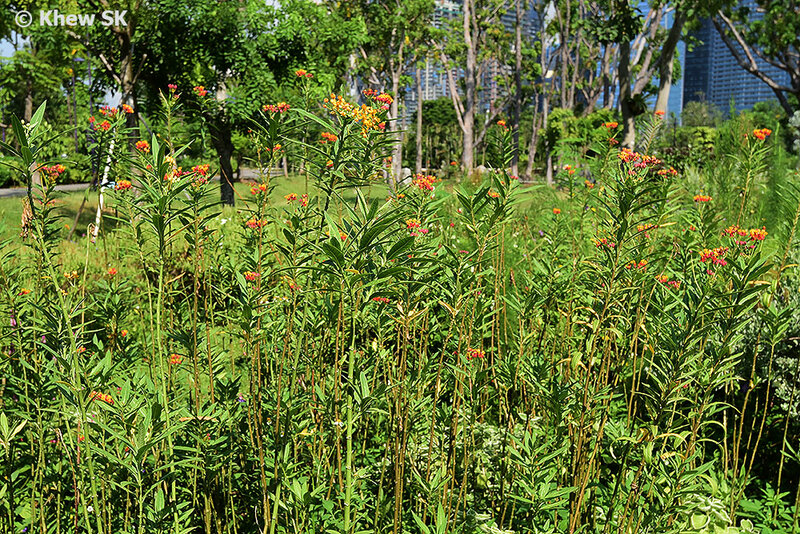 The plant is a woody shrub that features a spreading but rounded crown and growing up to an average height of 5m tall. The flowers are red, blooming in puffs with red silky stamens. Although visually attractive, the flower of the Red Powderpuff are not as often visited by butterflies as expected. Medium-sized species like the Common Mormon, Striped Blue Crow and Orange Emigrant have been observed to feed on the powder-puff flowers. 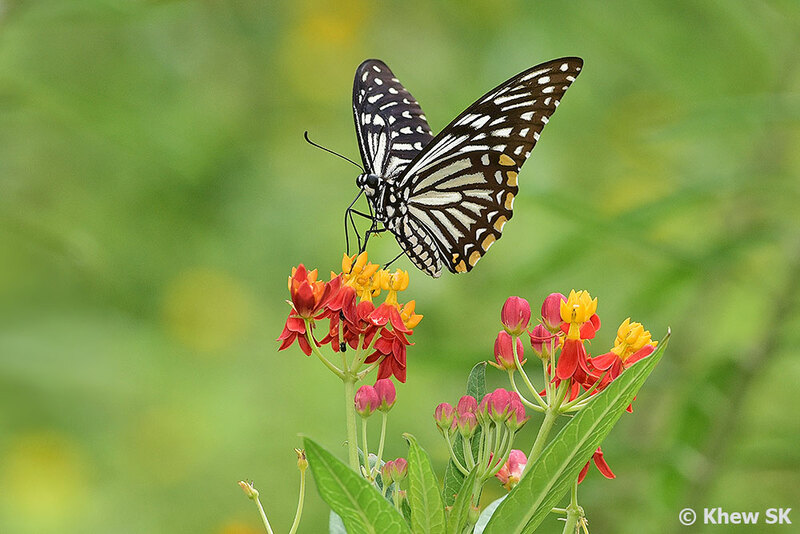 In the next part, we will look at more flowering plants, including some wildflowers, that butterflies visit to feed in search of nectar.